This election cycle, apparent Republican presidential candidate Donald Trump has made numerous headlines for his proposed ban on Muslims from the United States. “Muslims for Bernie,” a group made up of members of the Sacramento Muslim community, came out to the Bernie Sanders rally today to push back against that sort of rhetoric. The group’s main purpose is to stand by Sanders and his “call for equality among different cultures,” according to group member and American River College student Tulaib Zafir. Zafir, a philosophy major at ARC, said he supports Sanders because of his “blunt honesty regarding the issues facing the country” and for “not attacking” anyone. Zafir pointed to events on ARC’s campus, like last semester when activists put up signs that said “Why Islam kills,” as a main reason for why he’s taken a strong interest in politics. “We have to get involved and Muslims usually don’t,” Zafir said. Zafir said that Sanders’s policies were the only ones that he felt comfortable with. Another member of the group, Ibrahim Chedade is a student at Del Campo High School and shares the feeling of “hope” that Zafir gets from Sanders. “He’s the first politician to really go beyond the surface of politics and actually work for the greater good,” Chedade said. Chedade said that there has never been a candidate that the majority of the Muslim community has been able to unify behind. He added that, regardless of the election results, Sanders’s campaign has “planted the seeds” for future change. “No matter what, the message will not die here,” Chedade said. Omar Mahmi, also an ARC student, was with Zafir but denied to comment because he was with press. 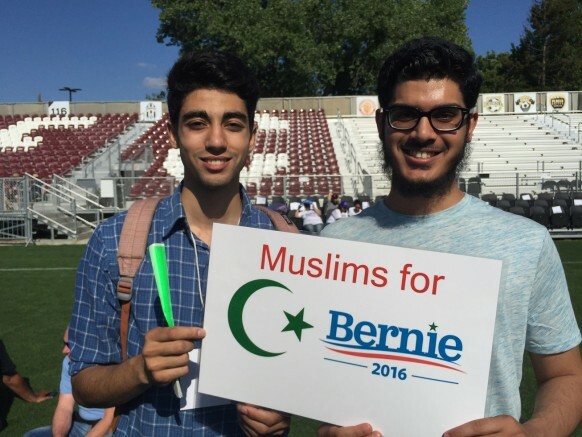 Be the first to comment on "An ARC student attended Bernie Sanders rally with ‘Muslims for Bernie’ group"